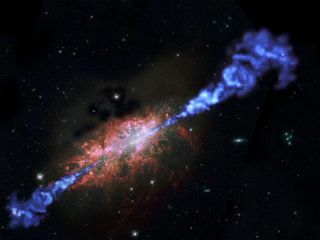 Artist's impression of a distant active galaxy firing off jets of powerful radiation. As galaxies feverishly churned out new stars in the early universe, the huge black holes at their hearts were firing off intense bursts of energy, a new study reveals. The discovery could help explain why more massive galaxies host more massive central black holes, researchers said. And the find sheds light on the dynamics and growth of so-called "active galaxies" such as quasars, which were abundant in the early universe. By contrast, many modern galaxies, including our own Milky Way, are inactive, with quiet central black holes and very low star-forming rates. "It is becoming clear that active galaxies are not only among the largest, most distant, most powerful and most spectacular objects in the universe, but also among the most important objects," study lead author Peter Barthel, of the University of Groningen in the Netherlands, said in a statement. "Many if not all massive normal galaxies must also have gone through similar phases of simultaneous black hole-driven activity and star formation," he added. Barthel and his colleagues trained the European Space Agency's far-infrared Herschel space telescope on 70 faraway active galaxies, whose supermassive black holes blast out jets of exotic and intense radiation. These jets are powered by steady accretion of material onto the black holes. Until recently, little was known about these distant active galaxies, and their relationship to the population of "normal" galaxies remained mysterious, researchers said. But the new results could help clear things up. The team found that many of the active galaxies emit strong far-infrared radiation. This indicates that vigorous star formation is taking place, creating hundreds of new stars per year during one or more episodes lasting millions of years, researchers said. The detection of bright radio-wavelength jets also implies strong, simultaneous black hole accretion. So the ancient, distant galaxies grew in tandem with their central black holes long ago, birthing new stars and firing off jets that became increasingly intense as the black holes' appetites got bigger and bigger. The study was published last month in The Astrophysical Journal Letters. Follow SPACE.com on Twitter @Spacedotcom. We're also on Facebook & Google+.